We live in a world awash in identities and identity politics. It is hardly surprising that we think art can enact, create, and modify individual and collective identities. In this constellation we subject this idea to historical scrutiny and theoretical analysis. We investigate the role of art in the formation and imagination of polities and communities, and how these cross-cut with notions of race, class, gender, religion, nationality, and ethnicity. Farhad Moshiri: Go West, an exhibition curated by Jose Carlos Diaz, The Andy Warhol Museum’s chief curator, is currently on view at The Andy Warhol Museum. This is the Iranian artist’s first solo exhibition in the United States, surveying two decades of Moshiri’s career. Moshiri rose to fame with his embellished, jeweled paintings adorned with calligraphic inscriptions of Iranian pop poetry. Over two decades, his works referenced the Iranian pop culture, calligraphy and decorative arts in dialogue with the prevalent American culture of entertainment and consumerism, ubiquitous in Iran of 1980s and 1990s. Often profiled as a Pop artist, his art defies categories of art commonly associated with the Middle East. He uses icons of the Iranian and ancient Persian art, but unlike his Iranian modern predecessors of the 1960 and 70s, he is not much interested in abstraction. Rather he employs visual markers of Middle Eastern art to comment on consuming an imagined Persia. In the context of The Andy Warhol Museum, Farhad Moshiri’s works find a situated-ness that otherwise would not be as visible to the Iranian and non-Iranian audiences alike. Seen in this context Moshiri initiates a dialogue with the Western imported pop culture, Western movies, Disney cartoons and French postcards on the one hand; and iterations of the Iranian consumerism on the other. Seen next to Warhol’s interest in and referencing of the American pop culture, Moshiri’s labor-intensive, elaborate remaking of popular everyday objects juxtapose infinite reproducibility with an obsessive hand-making of images; a way of making reproducible objects of one’s own by dense, rich textural adornment and adoration. Moshiri’s art could be thought of as a playful manipulation of mechanisms of desire, labor and language. By flattening ancient objects in his famous jar series (Faghat Eshgh-Only Love, 2007) he generates a metonymy of the Ancient Persia, an imagined identity referring to everyday lives of Iranians who were exposed to the globalized capitalism especially during the years after the 1979 revolution and who found it necessary to define Iranian-ness in the face of an increasing political isolation of the country. Such artistic strategy also redefines objects linguistically, linking the Persian calligraphy, a form of “sublime” artistic production to consumerism. Moshiri notices how calligraphy, an art of Persian royal courts and a revered form of art practice became a commodity of the world of art and a marker of identity. But perhaps the most striking about his recent works, such as the Frosting Stories series, is their uniquely sensory quality. Viewing Moshiri’s art closely is a completely different experience. The glittery, ornate details strike a chord with the viewer's sense of nostalgia and desire; and it would be fair to say that the Iranian and American audiences both experience such an affective, visceral response. The rich textures and subtle details recreate the Persian 17th century architectural elements, Persian manuscript illumination and calligraphy, but in the shape of cake frosting and cheap jewelry; something thet one wants to touch, and taste. Something that is commodifiable Yet the commodities Moshiri offers us always entail an uncomfortable encounter that is either sexually charged or implicitly violent. Moshiri’s use of domestic labor is also worth noting. He employs local craftswomen whose specialty is making wedding dresses to create garish, glittery beaded surfaces and embroidered paintings; a form of low-brow, domestic art which was never taken seriously vis-à-vis sublimity of the Iranian Modern art movement of mid-1960s and 1970s. While the imagery is playful and cartoonish, the rich texture is indicative of hours and hours of labor, hence implying a subtle sense of discomfort in the contradictory co-existence of labor and consumerism. Moshiri was born in 1963 in the early years of the Iranian modern art movement; he is well aware of the legacy of the Iranian modern art as a form of 'committed art' which at the same time drew heavily on the EuroAmerican tradition of modernism. It so seems that Moshiri’s glittery, elaborate surfaces respond to a culmination of events before and after the Iranian revolution of 1979, when revolutionary aspirations of the modern art were replaced by a fervor to accumulate objects and consumption of identity. Golnar Yarmohammad Touski presented her response to a tour of the Fahrad Moshiri: Go West exhibition by Jose Carlos Diaz on October 20 at The Andy Warhol Museum. The above blog post records her comments and reflections on this occasion. 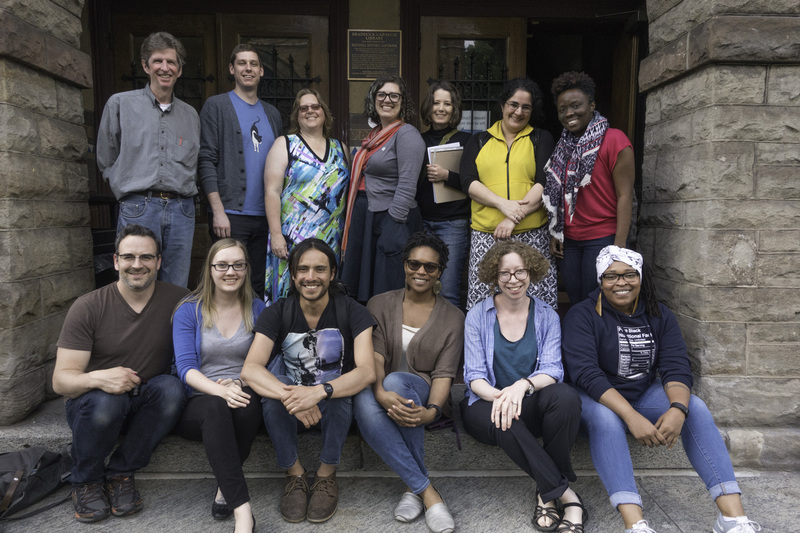 Our workshop ended on Friday the 13th with a beautiful day at the Carnegie Library of Braddock with the artist collective Transformazium, after a packed week of field work and intense conversation with an amazing group of graduate students and faculty from across Pitt's campus. Over the course of the week we met and talked with various curators, educators, and archivists at the Carnegie Museum of Art, the Teenie Harris Archive, the Hunt Institute for Botanical Documentation, the Heinz History Center, the Allegheny City Gallery on the Northside, Pitt’s special collections and multiple archives, and the Art Lending Library in Braddock. We interacted in various ways with objects on display and brought from storage, as well as curated selections of mixed materials from larger collections, and on the last day had a chance to do some speed-curating of our own in the art lending space at the Braddock Library. In between, we talked a lot about what we had seen and heard and about what we should do to put ideas in practice and push the conversation forward in public. For me personally it was a revelation to move from one radically different collection to another and to ponder the structural differences that help determine their narratives, audiences, and engagements. Each institution has its own criteria of quality and value. These value systems in turn create communities around them. Some systems are inherently more exclusive than others and therefore present particular challenges for an ethic of inclusion. At the Hunt Institute, for example, with the help of their generous staff we spent a couple of hours examining prints and books mostly against the grain: we looked through botany books and various records of collecting expeditions by European and Anglo colonizers to see how they represented the indigenous and enslaved peoples who actually supplied much of the knowledge. Against the hierarchy of power and knowledge communicated by the materials themselves, we worked to recover the devalued voice and expertise of the peoples at the bottom of the hierarchy. At the Teenie Harris Archive, in the Carnegie Museum of Art, with the help of their equally generous curators, we had the privilege of entering a lost world – the largely African American Hill district before the destruction wrought by urban renewal – through the eye and lens of the maker himself, a man who did not self-identify as an artist and who rarely entered the art museum where his huge collection eventually found a home. Here the institution has the good fortune to mine the knowledge of the community, because many of them from those days are still alive and come in to talk about their pictures and their world. And so an archive of images has also become an archive of oral memory and of written history, all deeply interwoven into a still living community fabric. A quote my co-facilitator Shirin read to us two days later keeps returning to my mind: If one no longer has land, but has memory of land, then one can make a map. And in Braddock, where Shirin read that passage – one of the poorest municipalities in our region – we thought about the value system of an art lending library in the context of a community whose resources, knowledge, and creativity tend to be ignored in a racialized master narrative of blight and distress. Here is a public library that lends original art for three weeks to anyone with a county library card – art that includes work donated by every artist represented in the 2013 Carnegie International, black arts printmakers, emerging artists, and paintings by incarcerated men in a prison art program. All of it surrounded by books on art and society in a light-filled room with salaried art and culture facilitators from the nearby community to discuss the art and its makers and stories. From these artworks and books we curated our own multi-media displays on various themes which had emerged here and there in our week-long conversation. That conversation was simultaneously challenging, contentious, draining, and energizing. But the big question we returned to all week was what can we do? Many interesting ideas for real projects came out over the course of the week, and some initiatives have gotten started. We are talking about exhibitions and websites and courses and new partnerships and pedagogical initiatives. I’m sorry I won’t get too specific at the moment, because we are in the early stages and some ideas may blossom and others may not. But, with a little patience and some more work, we’ll start to roll out ideas and proposals and solicit advice and feedback. We promise to keep you posted. In our far from post-racial world, museums are increasingly feeling the pressures of demographic change and urgent new campaigns for racial justice. Famous European museums are altering the titles of art works to eliminate demeaning terms; Confederate monuments are being dismantled in public space and sent to history museums for storage; museums across the U.S. are scrambling to shed their image as bastions of privilege and to diversify their audiences and supporters. How have museums, as collections and as institutions, created, supported, or challenged constructions of race and racial identity? How are museums and their objects implicated in the history of slavery, indigenous peoples, and race relations? How have museums represented and interpreted these issues? How can and should their collections tell different stories? What can museums do to combat white privilege, and become more inclusive in their institutional structures and in their audiences? For one week in May, a group of twelve faculty and graduate students representing nine different departments here at Pitt will tackle these questions in a new workshop funded by the A.W. Mellon Foundation. Drawn from a wide array of fields from anthropology and history of science to English and art, the participants will go behind the scenes in local museums, dig into collections, and talk with curators and museum educators to see how they deal with these issues in their institutions and careers. But we also plan to do more than just talk, as important as that is. Every participant in the workshop will develop an individual or collaborative project to carry the workshop forward, whether it be a revised course for undergraduates, an exhibition, a publication, a community engagement initiative, or even a new partnership with a local institution. We hope these projects will not only be transformative for the participants themselves but have ripple effects within the university and museum communities and ultimately out in the city and region as well. Please check back in later and we will point you to a new website documenting their work and its impact. On October 24-26, 2015, we had the pleasure to participate as presenters, panel chairs and attendees in the Southeastern College Art Conference (SECAC) annual conference, held in Pittsburgh this year. Among numerous interesting presentations, the following in particular caught our attention due to their detailed references to the topic of identity, which is the common ground of our affinity group for the class Methods of the History of Art and Architecture: “Transplanted Croatian Works in Maksimilijan Vanka’s Millvale Murals” by Heidi Cook, “The Confluence of Art and Identity” chaired by Scott Sherer, “Art-Making as Cultural Translation” chaired by Sasha Crasnow and Elizabeth Rauh, and “Manuscript Studies” chaired by Robert Tallaksen. In addition to the relevance of some of these interventions for our independent projects, they help us to refine our understanding of ‘identity’ as a lens through which we analyze a work of art. Given the resurgence of nationalist and ethnic violence in the 1990s and the more recent increasing popularity of nationalist parties in Europe in the light of the mass migration of peoples from the zones of conflict to the European Union, Heidi Cook’s paper on “Transplanted Croatian Works in Maksimilijan Vanka’s Millvale Murals” was particularly interesting. Cook’s research reveals that today's interpretation of the Vanka's murals focuses primarily on the works’ social justice and antiwar messages, in effect discouraging visitors thinking about nationalism in a positive and constructive way. In fact, Ms. Cook argues that while works like the Vanka's murals can be misinterpreted and misappropriated for support of reactionary nationalism, Vanka’s murals are actually about the modern art and culture of Central European and Croatian American immigrants, and the relationship of local imagery to a whole spectrum of local identities. From the panel “The Confluence of Art and Identity” chaired by Scott Sherer, the papers on artists J. Yoo Hyun Lee, by Nogin Chung and on Eleanor Antin, by Jennifer Kruglinski were of particular relevance for our interests. According to Chung, J. Yoo Hyun Lee challenged the spectacle and tourism of traditional South Korean art that makes locals feel like “the other” in their own communities. To accomplish this, J. Yoo Hyun Lee created a communal experience that was wholly driven by the town members with no political agenda, reference to nationality or race, or intended audience other than the community itself. From a different angle, Kruglinski presented the work of Eleanor Antin as a visual and individual challenge to imposed identity categories, such as gender and the behaviors usually associated with it. Through iconography, Kruglinski analyzed identity as a major topic in the work of Antin, understanding it as a subject of permanent reflection and questioning. 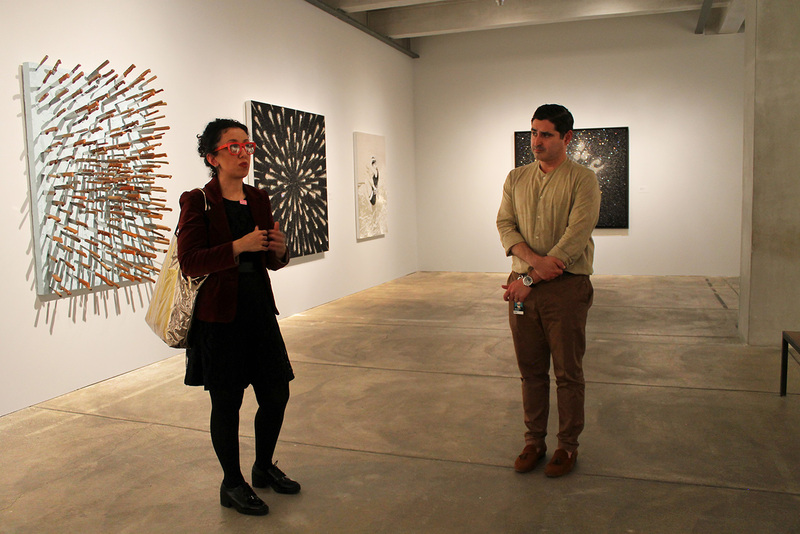 While Chung considered the work of Yoo Hyun Lee for its long-lasting impacts and its temporal existence as a work of art in relation to the identity of the community where it took place, Kruglinski offered an encompassing analysis of Antin’s work emphasizing on the mutable representation of the self as presented in her artworks. In the panel “The Medium is the Message: Art-Making as Cultural Translation”, Elizabeth Miller’s paper, “Muhammad Nagi: The Promotion of the ‘Dictator-Aesthete’ through Pen and Paintbrush” discussed how the art of Muhammad Nagi both corresponded and rejected the shifting ideas of national identity in Egyptian modern art in the early 20th century. She argues that although Nagi’s work has often been considered part of a nationalist art movement that aimed at portraying a unified Egyptian nation, in his art and writing his vision for the nation was not unified with others in the movement. He rejected the populist direction that the School of Fine Arts in Cairo encouraged, and through an analysis of his writing and art she argues that he wanted his work to help develop an elite-controlled “Dictator-Aesthete” which would serve as a proper cultural base for the art of the new Egyptian nation. Miller pointed out that this individual articulation of nationalism changes the meaning of Nagi’s work, from something that stands for the nation to a single part of a spectrum of opinions on the nation and art. Her paper questioned how we characterize artworks that are both statements of collective belonging and the individual creation of a particular artist, and what aspects of the work we choose emphasize in our conclusions. When do we see a work of art more as a statement of collective identity or individual identity, and why? In “Manuscript Studies,” chaired by Robert Tallaksen, the panel chair presented a paper at the end that had a surprising relationship to our affinity group. Through analysis of written documents, Tallaksen discovered that in the middle of his career, Michelangelo Buonarroti made a deliberate change in his handwriting script. Instead of an evolution or progressive alteration in style, Michelangelo abruptly shifted from one form of script to another. Tallaksen then explored how this change could be seen as a way of intentionally affiliating himself with others who wrote in this new way – namely humanists and those deeply involved in the philosophies of Neo-Platonism. This paper revealed a unique consideration on how one formulates his public identity. ‘Identity’ was a well-represented and widely discussed subject at SECAC, and the conference transposed many different methods with one another, revealing interesting and essential differences in their approaches. An undercurrent in all the talks attended was the negotiation between context and biography as the locus for identity. Some speakers focused on art as something that defines identity beyond that of its original creator (Cook, Chung), while others focused specifically on the artist and his biography as the center of identity (Tallaksen, Miller), or on the possibilities of a changing, individual identity as expressed through a created object (Kruglinski, Tallaksen). In other talks not expounded upon here, presenters focused on identity entirely defined by the environment by looking at portraits in relation to other nearby works of art (Winter, Morse in “Cross Canvas Conversations”), and on innovative readings of an artist’s personal identity as the result of a detailed visual analysis of a particular work of art (Adler, Mazzola in “Currents of Transformation: Geography, Identity, and Ideology in U.S. Art”). Together, the juxtaposition of these varied and impressive approaches to defining identity will undoubtedly influence our group’s scholarship as we seek to understand identity in our chosen objects of research. The Visual Media Workshop in Summer 2015...waiting for Fall Term to begin! Please read this article, "An Undergraduate's Love Letter to Digital Humanities Research," by Tiffany Chan...and let me know your feedback (either below in the comments if you have worked here before...or to adl40@pitt.edu for everyone). For those interested in working and learning here in the Visual Media Workshop (VMW) in the future, this essay, written by an undergradate about her experiences in the digital humanities, provides a taste of the potential opportunities in the field. We strive here in the VMW to create a community where all ideas are heard, and where we sincerely want each other to succeed. A number of the members of the DH community at Pitt have put together the following list of texts that do a good job of introducing the overall state of the Digital Humanities in North America at the current moment. It begins with a section called, "Articles and Shorter Pieces," which has been kept intentionally brief so as to give you a good taste of the field without being overwhelming. Should you end up with a desire to read more, the next section entitled, "Larger Works," should satisfy many a curiosity. Finally, this post ends with a "Projects" section which includes just a few projects, some created here, others elsewhere, that have captured the attention of this community. David M. Berry, “The Computational Turn: Thinking about the Digital Humanities,” Culture Machine 12, 1-22. http://culturemachine.net/index.php/cm/article/view/440/470. Berry is a theorist and a maker, but his texts often take the long view, which makes him an apt choice here. Provocative and useful overview of DH from creation to assessment. A history about the formation of DH as a "proper" field than it is about English, and it covers how DH became a thing of note at the MLA conference. Another fine introduction from a slightly different point-of-view. Those wanting to know something about "data" in the humanities can start here. Others may have a more provocative approach, but this one is pretty even keel. Today is my last day working on the Itinera database until my presentation tomorrow. While gearing up for the end of the semester, let's take a moment to look back at the unfortunate life of Thomas Bruce. Thomas Bruce suffered from asthma throughout his life, so under his doctor's orders, he doused his face with mercury for his frequent lung complaints. Medical treatment in the 1700s certainly is not what it is today. The mercury caused abrasions on his nose, which prompted doctors to cut off the tip of it, disfiguring Bruce's face. In August 1803, Bruce was traveling with his wife, Mary Nisbet, and got detained by the French in Bareges, because he was a British ambassador with a travel schedule that coincided with the Napoleonic Wars. From there, he was eventually sent to prison at Lourdes. 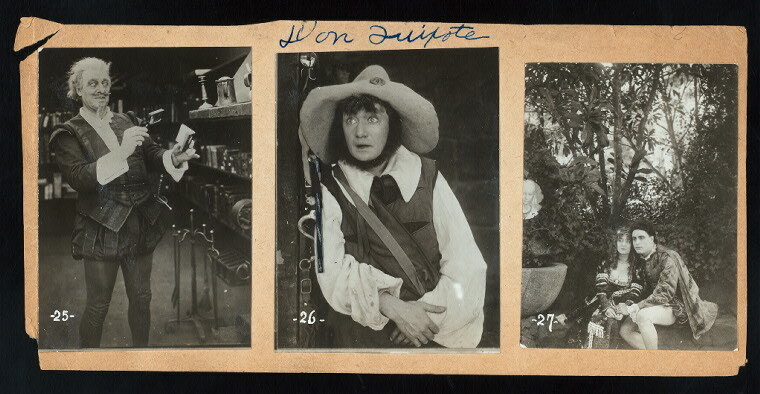 While he was incarcerated, Nisbet was allowed to leave France, accompanied by a man named Robert Fergusson. The two were secretly engaged in an affair, and Fergusson would go on trial in May of 1808 for adultry. 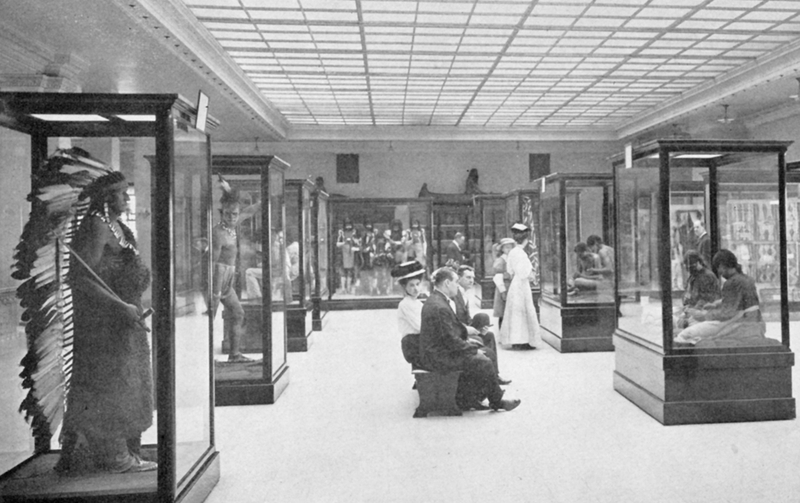 In 1816, facing bankruptcy, Bruce sold his prized marbles to the British Museum. He said that the marbles were worth about £75,000 (roughly $111,360), but the museum bought them for £35,000 (about $51,950). Needless to say, he was not happy about the sale. Between his cheating wife, partial nose and massive debt, Bruce was not a happy person. Because he bought the marbles and messed with Greek culture, people still don't like him after his death. And they certainly don't pity him. He will always be remembered as the man who brought antique culture to Britian, but at the expense of ancient Greek identity. Nagel, Susan. Mistress of the Elgin Marbles: A Biography of Mary Nisbet, Countess of Elgin. New York: William Morrow, 2004. Print. Vrettos, Theodore. The Elgin Affair: The Abduction of Antiquity's Greatest Treasures and the Passions It Aroused. New York: Arcade Pub., 1997. Print. Last week, I got into the story surrounding Thomas Bruce and the Parthenon Marbles. Now, let me tell you about the controversial past (and present) of these artifacts. As I mentioned, Bruce had to get a firman from the Ottoman authorities in order for his workers, including Giovanni Battista Lusieri and William Richard Hamilton, to continue sketching the Acropolis in Athens. He eventually got this letter of permission in early 1801, and the document was deemed official by July 1. However, due to transnational tensions that culminated into the Napoleonic Wars (1803 - 1815), government paperwork and rules at the turn of the century were a little murky. This led to a disagreement on the true owners of the Parthenon Marbles. People who want the Marbles to stay in London say that Bruce obtained the firman with the full knowledge and permission of the Ottoman Empire, which controlled Greece at the time, so his actions were completely legal. But people who want the Marbles returned to Greece say that the Marbles should be replaced to their homeland, stating that Bruce illegally stole the Marbles during Greece's Turkish occupation. Bruce removed the Marbles between 1800 -1811, but then sold them to the British Museum in 1816 because he was facing debt. Controversy about the Marbles was reintroduced in 1925 when a newspaper argued that Greece should be able to reclaim the Marbles. Today, why do people care about the movement of the Marbles if it happened almost 200 years ago? 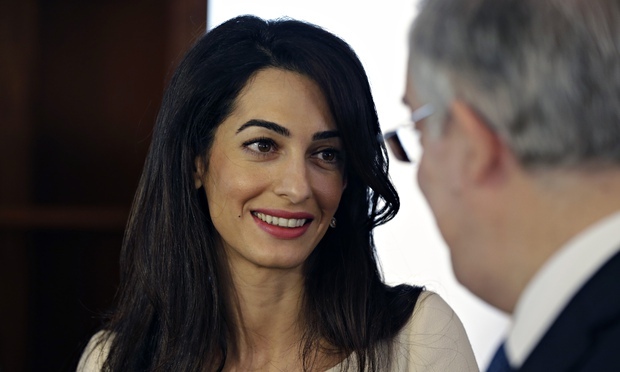 In October 2014, the London-based lawyer/activist/author Amal Clooney said that Greece had "just cause" for the return of the Parthenon Marbles. So even today, the plot thickens. Why does this even matter? Well, the controversy about the Parthenon Marbles is important for a couple of reasons. Pro-London supporters say that the Marbles are "an important representation of ancient Athenian civilization in the context of world history" and they give "maximum public benefit" to the people of England, so it is more important that they should stay in London than go back to Athens. To these supporters, the Marbles represent a moment in antiquity and continue to emphasize the ancient Athenian culture to the modern public. Pro-Athens supporters say that the Marbles are an important symbol of the whole nation's heritage - in the present, not just in antiquity - and they should be returned for the sake of national pride. The significance of the Parthenon Marbles is completely defined by society, meaning that people assign importance to these ancient sculptures. These artifacts are symbolic of an all-but-lost ancient culture, and if Greece ever gets the Marbles back, the nation will have to reevaluate their cultural significance in a modern context. In late March, Greece requested the return of the Parthenon Marbles for the second time. The British Museum turned down the request, and it is unlikely that the Marbles will be returning to Athenian soil anytime soon. With generous support from the Dean of Graduate Studies, ten HA&A graduate students (Maria Castro, Nicole Coffineau, Clarisse Fava-Piz, Annika Johnson, Isaac King, Colleen O’Reilly, Ben Ogrodnik, Nicole Scalissi, Krystle Stricklin, and Marina Tyquiengco) traveled to New York to conduct individual research and attend the annual conference of the College Arts Association. 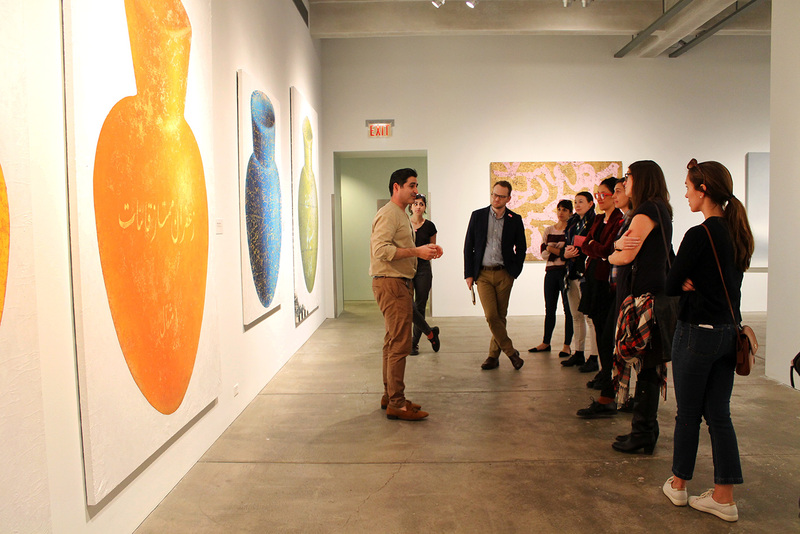 In a colloquium on March 25th, these students discussed their research, their newly acquired tools and knowledge, and the presence of the constellations at CAA. Attached is the slideshow from their discussion which includes some resources and potential jumping off points for further discussion in the department.